Perhaps unsurprisingly, the first Wii U game to utilise near field communication (NFC) tech will be a Pokémon game. According to scans of Japanese magazine CoroCoro, Pokémon Rumble U will launch in Nintendo’s home country on April 24.It will allow players to purchase collectible Pokémon figures from stores and import virtual versions into the game using the Wii U GamePad‘s NFC reader. The game will be priced at 1,800 yen (£12.60) and will release alongside seven Pokémon figures each priced at 200 yen (£1.40). Apparently you’ll be able to level up and record battle information on the toys themselves. The game’s story sees players attempting to return lost Pokémon to a toy shop, while facing various bosses such as Chandelure. Western release plans for Pokemon Rumble U have yet to be confirmed. Nintendo design guru Shigeru Miyamoto said last week that Nintendo is currently prioritising the development of NFC-enabled Wii U games over those that support dual GamePads, and that the company hopes to show off its work in this area soon. It’s a story so well known now that we’ll just summarise it for you: what is now known as Super Mario Bros.: The Lost Levels was actually released in Japan as the sequel to enduring classic Super Mario Bros. Western gamers instead received the subconscious vegetable buffet that we more traditionally think of as Super Mario Bros. 2. Various reasons have been given for the switch — brutal difficulty ranking high among them — but whatever the rationale, we’re glad that we’re able to play both sequels to the original classic, as they’re fantastic in their own ways. The Lost Levels, of course, is best known for its controller-smashing challenge. Even with the restore points on the 3DS Virtual Console, you’ll be in for some serious difficulty. While this game doesn’t innovate the franchise nearly as much as its Western cousin did, it does take some interesting liberties with the formula set down by its predecessor. For instance, Luigi has distinct jumping and running physics from Mario, a sort-of tradition that would reappear in several other games to come. For fans who knew the original game inside and out, this alteration was both a serious curve-ball and an impressive new way to experience the Mushroom Kingdom. Speaking of the Mushroom Kingdom, The Lost Levels obviously takes place in an even more vicious region than the original game did. Here you’ll find all manner of traps to take you down in the most ingenious — and sometimes hilarious — ways. Everything from springs, to invisible coin blocks and even warp zones will conspire to work against you, and it’s unlikely that anyone other than the most expert players will find their life counter reaching double digits. Visually there’s not much new here. 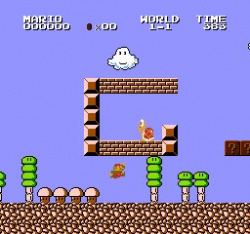 Nearly everything has been carried over wholesale from the first game, though there are a few notable exceptions, such as the notorious poison mushroom. Otherwise sprites are identical to the originals, even if they behave in new and interesting ways, such as the increased lift you’ll get from a stomped enemy, and a surprising overworld appearance from an enemy you’ll only have previously encountered under water. The Lost Levels are — this cannot be said enough — relentless. Expect to die, and expect to die often. In fact, the entire release feels like a ruthless ROM-hack more than it does a proper title. It’s another pack of levels designed explicitly to break your spirit and frustrate you endlessly, packed with pixel-perfect leaps, blind jumps, and sadistic castle mazes. But one thing’s worth noting: regardless of how difficult the game gets, you can never fault its physics. Yes, much like the original, The Lost Levels controls brilliantly. The game is responsive and reacts immediately to every press of a button; it’s not its fault if you decided to leap into that pit, after all. The music is also carried over from the first game, again making The Lost Levels feel like a bit of a retread. When measured against the significant changes introduced by the Western sequel, The Lost Levels feels like it lacks innovation. What it does do, however, is build upon the innovation of the first game, and re-employ enemies and gimmicks in extremely creative — and punishing — ways. 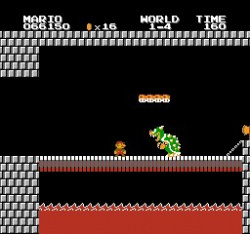 If you enjoyed the first Super Mario Bros. game (and really now, who didn’t?) then this is an expansion worth experiencing. Don’t expect to finish it, though; it’s not an experience many people will complete, but it’s one everybody will remember. Anyone who feels that Mario’s 2D adventures have softened over the years owes it to themselves to experience Super Mario Bros.: The Lost Levels. With a difficulty curve that’ll have you pulling your hair out by the second world, game-loving masochists are in for a genuine treat. Be warned, however: the challenge here is unquestionably excessive, and it’s not an experience for everybody. Those willing to invest the time — and who aren’t afraid of shouting a few cursewords — will find a clever and creative palette of charming frustrations here to greet them. And, frankly, we think it’s worth a little grey hair. The YouTube and Amazon Instant Video icons have been present on US Wii U consoles since its launch last weekend, but clicking them didn’t do much, until now. Both Amazon and YouTube have made their video apps live for Nintendo’s new console Stateside. Clicking on the icon now will prompt you to download the full app.Amazon Instant video offers 140,000 movies and TV episodes available to purchase or rent, while Amazon Prime customers can stream 30,000 TV episodes and movies at no additional cost. The YouTube app, meanwhile, looks rather like the original Wii one, but can now stream true HD content, and uses the GamePad screen to browse content and display video details while viewing, and the GamePad can be used as the primary viewing screen. Just to be clear, the update doesn’t actually do this. Although Australians won’t see the Wii U until 30 November, the next-gen console has already launched in the US. Already under fire for the massive 5GB day-one firmware update that users require to activate a number of system features — such as Miiverse, the online store and the compatibility for older Wii games — reports are coming in that interruptions to the download can render some consoles inoperable. Ars Technica noted that a number of forum posts and tweets — including one from LA Times reporter Ben Fritz — indicated that interruptions to power or internet access during the update won’t just require you to try again; it’ll actually kill your console completely. While there’s no official comment from Nintendo yet, bricked consoles should be covered by the standard warranty, and — fingers crossed — the issue will be sorted by the time of the Australian launch. Gaze upon this loveliness and hope for a global release date! RPG fans were delighted by Square-Enix’s recent plans to revamp and rerelease Dragon Quest VII on the Nintendo 3DS. With development well underway, the videogame giant has seen fit to show off some screenshots of the project itself, and we must say it’s looking pretty gosh-inducing. Siliconera has rounded up a wealth of imagery to be perused, which showcases a variety of gameplay elements from conversation to battle and exploration. Comparing these images with those from the much beloved Dragon Quest IX on the Nintendo DS is like night and day. Square-Enix seem to have gone all out in bringing this roleplaying classic to the Nintendo R4 3ds with style, and with an orchestral soundtrack promised it seems the audial experience isn’t going to disappoint either. Another fine day in the countryside ruined by an amateur Benny Hill chase. The classic Dragon Quest art is in full effect, promising a vast world to explore and a ton of characters to meet, greet and inevitably perform all kinds of dangerous quests for. The monsters are just as outlandishly silly as we remember them, offset by the classic battle system that’s underpinned the franchise for years. Dragon Quest VII on the 3DS is currently slated to release in Japan on February 7th, 2013. An international release is yet to be announced, but we hope Square-Enix will make it happen, as this certainly looks to be the perfect remedy for 3DS fans in need of some epic RPG action. T.S. Eliot might have called April the cruelest month, but for Sony it’s difficult to imagine a month crueler than November. After last week’s sobering sales figures which saw sales of the PlayStation Vita slip to a record low, Sony’s latest handheld has slid even further down the hardware charts in Japan, selling only a modest 4,021 units between November 5 and November 11. Based on the numbers posted by Media Create, this is a 17 per cent decrease from last week’s figure of 4,842 Vitas sold. Sony’s PlayStation Portable also slipped a bit in sales, falling from 13,868 units sold to 12,076 – yet it still managed to outsell the Vita three to one. Nintendo’s 3DS saw a substantial increase in sales this week, owing in no small part to the release of Animal Crossing: New Leaf. Sales for the 3DS jumped 99 per cent, surging from 93,989 units sold last week to 187,077 units sold. Unsurprisingly, Animal Crossing: New Leaf secured the top-selling software spot for the week while New Super Mario Bros. 2 and Bravely Default Flying Fairy remained the fifth and sixth best-selling games, respectively. Konami‘s World Soccer Winning Eleven 2013 was the only PSP or PS Vita title to rank in the top ten for the week, coming in at the number eight position. 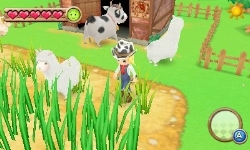 You probably know what makes a great Harvest Moon game by now. Being left to your own devices, with the occasional nudge towards things you might want to check out, is the key to farming heaven. The latest in the series, A New Beginning for Nintendo 3DS, introduces a huge number of new elements that genuinely add to the base experience, and breathe new life into the age-old franchise. If only we didn’t have to battle through tortuous hours of awful tutorials and locked content we might have enjoyed it. Unfortunately, any possible enjoyment is dulled by the first dozen hours or so. The basic Harvest Moon outline is still there, and still going strong. You’re tasked with keeping your family farm in check, looking after the crops and keeping your animals fed and warm. On the side, there’s a town full of people to interact with, potential wives/husbands to woo, and extracurricular activities to get involved in. Before you can tend to any of this, however, you’re going to have to put up with many, many hours of slow, tedious tutorials, and barely any content at all. A New Beginning may well have the slowest start to a game that we have ever experienced. For the first several hours, there’s so little to do that you’ll spend most in-game days simply watering your plants, tending to your animals, and then going back to bed at 8am. It’s an absolute nightmare, truth be told. You know that there’s a ton of content ready and waiting for you to dive into, and you can see empty space and pathways all over the place that are ready to be explored. But until you’ve slogged your way through hours of not very much, it’s all off limits. If you’re able to snore your way through around a dozen hours of play, things finally start to pick up, and you witness the true potential of the game. There are tons of customisation options, from the way your character looks to the layout of your farm. There are new animals, new crops, new locations, new Harvest Sprites, and new everything, really. And chasing your preferred bachelor/bachelor is as fun as it ever was – as is watching the nearby town build up into a bustling area of discovery. This is truly a jam-packed Harvest Moon, with more content that you’ll know what to do with. But none of this matters if you can’t bring yourself to slog through the first, utterly atrocious section. Why developer Marvelous thought it was a good idea to hide the good stuff behind a wall of shallow, bare repetition is beyond us. Harvest Moon: A New Beginning is great when it finally gets going. Until that point, however, it’s barely even a game. Retail laptops and desktops won’t be the only computers preening around with a fresh new coat of Modern-style paint today. The boutique system builders over at Maingear just dropped us a line to let us know that it, too, will be offering Windows 8 in its lineup of high-end gaming offerings going forward. Maingear’s complete line of gaming notebooks now offer Windows 8 as an option, from the diminutive Pulse 11 all the way up to the behemoth Nomad 17. Speedy boot times and a bevy of under-the-hood improvements may entice gaming enthusiasts, but the mouse-unfriendly Modern interface could just as likely drive them back into Windows 7′s aging arms. No matter which operating system you choose, Maingear tosses in lifetime labor and Cellulari DUAL SIM support for its products. MSI recently announced plans to start shipping its GT60 and GT70 gaming laptops with Windows 8 as well, but didn’t mention any ongoing support for Windows 7. Most manufacturers seem prepared to jump to Windows 8 whole-hog. Boutique builders like Maingear may be the best bet for gamers still hoping to buy a Windows 7 notebook after existing inventories wear thin, though Dell has also said it plans to continue offering Windows 7 as an option on Alienware gaming PCs for as long as possible. PSone classic Dragon Quest VII is getting remade and enhanced for 3DS next year. Twelve years after it came out for PsOne, Square Enix is remaking Dragon Quest VII for Nintendo 3DS. A teaser site for the Dragon Quest VII remake says the game will be available on February 7, 2013. ArtePiazza, the studio that handled Dragon Quest VII and the Card Ds Two remakes, is developing Dragon Quest VII: Warriors of Eden for the Nintendo 3DS. Square Enix has confirmed as much via a Japanese teaser site, which dates the 3DS remake for release in Japan on February 7, 2013. ArtePiazza, who has previously worked on DS remakes of classic DQ games, is handling development on the R4 3ds Dual Core title, renamed Dragon Quest VII: Warriors of Eden, according to Siliconera. The much-praised Dragon Quest VII originally released on PSone in Japan in 2000, with a US launch the following year. The game unfortunately never made UK shores. Square is yet to detail release plans outside of Japan, but with previous remakes getting international releases, its a safe bet to assume this won’t stay Japan-only for long. Built by the same developer that worked on franchises like Advance Wars and WarioWare, this inventive three-dimensional puzzle game is easily one of the best 3DS titles on the Nintendo eShop. 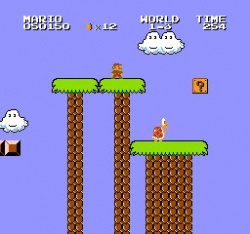 Using stereoscopic visuals, the player controls a little character named Mallo that pushes and pulls platforms out of a wall in order to climb to the top. The game does an excellent job of walking the player through the initial steps in the early levels and the challenge progressively increases throughout Pushmo’s stages. While the story behind little Mallo is silly, classic Nintendo fun, the puzzles are the real showcase. Just as addictive as Picross on the original Nintendo DS, solving each puzzle is extremely satisfying and encourages the player to continue. There’s even a custom puzzle creator for the more inventive players and puzzles can be shared with other players via QR codes. It’s also an excellent deal at $6.99 for the amount of time you will spend working through all 250 puzzles. Pushmo requires 144 blocks of space (18 MB) on a 3DS memory card. Not to be confused with the lackluster Samurai Sword Destiny eShop title, Sakura Samurai: Art of the Sword is an absolutely beautiful, action sword fighter with plenty of RPG elements tossed in to boot. Complete with a full narrative told in an animated slideshow, a young boy named Sakura Samurai is tasked with battling countless enemies in order to free Princess Cherry Blossom from a dark, powerful force. Spread out over thirty different locations within the game, Sakura Samurai faces off against ninjas, archers and other sword-wielding enemies. The game is heavily reliant in timed movements in order to dodge incoming attacks and counter with a devastating blow of attacks. As the player progresses through each stage, Sakura Samurai can visit local villages to save the game, purchase upgrades or simply stock up on helpful items. After battling through all boss castles and completing the game for the first time, a harder mode of play is unlocked to encourage another play-through in addition to time-attack and survival modes. Great for fans of action games, Sakura Samurai: Art of the Sword is priced at $6.99 and requires 457 blocks of memory (58 MB). Released this week on the Nintendo eShop, Dillon’s Rolling Western is a hybrid of an action title and a Tower Defense game. The player is put in control of a Wild West ranger named Dillon that also happens to be an armadillo. During the day, Dillon rolls around the old west collecting resources for the local town. Back in the village, Dillon is tasked with building up the local livestock (Scrogs), increasing the defensive ability of the fortifications and mounting guns on the towers spread throughout the village. As the day shifts into night, the town is attacked by rock-like creatures called Grock in typical Tower Defense style. While the Grocks are being weakened by offensive weapons on towers, Dillon can also directly damage groups of enemies during attack instances. Once the attack is completely repelled for the night, Dillon heads to the saloon to upgrade equipment, train on various attack moves and accept quests that will add more cash for village upgrades in the future. This cycle repeats over three full days and the player is awarded a star rating which unlocks more towns as stars are collected. Overall, it’s a fun twist on the Tower Defense genre, but players will need to focus on resource management just as much as the action. With approximately 15 to 20 hours of gameplay,Dillon’s Rolling Western is priced at $9.99 and requires 377 blocks of memory (48 MB). Paying homage to the 8-bit days of the past, Mutant Mudds is a clever platformer that combines 2D gameplay with a 3D effect made for the R4i 3ds. The player takes control of a pipsqueak kid that’s faced with battling mutant mud monsters with a water cannon in order to save the planet. The 3D element within the game allows the player to leap from the background to the foreground and vica versa. The simplicity of the art style also makes the 3D feature easier on the eyes. Game length is an issue for Mutant Mudds as the twenty main stages don’t require a significant amount of time to complete. However, diehard platformer fans will spend time searching for all 100 diamonds within each level in order to acquire weapon and jetpack upgrades. These upgrades help the player unlock 20 additional levels hidden within the game, a difficult feat without spending plenty of time carefully working through each level. Recommended for classic platformer fans, Mutant Mudds is priced at $8.99 and requires a scant 134 blocks of memory (17 MB). One of the largest downloads on the Nintendo eShop at 1617 blocks (214 MB), Mighty Switch Force is a combination of a puzzle game and an action platformer. Spread over sixteen stages, the player takes control of Officer Patricia Wagon during her mission to recapture the five Hooligan Sisters. The developer makes use of the 3DS capabilities by allowing the player to switch blocks between the background and the foreground of the level design. These visual layers often require a good sense of timing to successfully navigate portions of each stage. The detailed art and advanced visual effects likely contribute to the large file size of the game compared to other eShop releases. 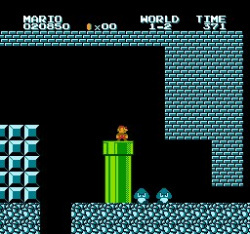 While the 16 levels can be completed in just a few hours, the developer attempts to encourage players to replay the game in order to beat a specific time. It does requires a great amount of practice to complete each stage in the target completion time and can be frustrating for novice players. However, this title is the cheapest game on our list at $5.99; a fair price for the amount of gameplay within Mighty Switch Force.